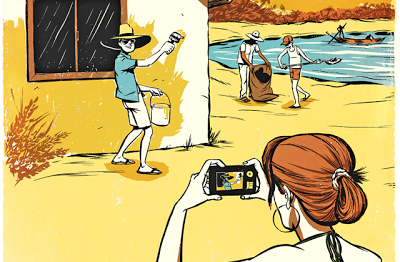 The Blue Yonder: Does Voluntourism Do More Harm Than Good? Dorinda Elliot from Conde nast Traveler reports after her volunteering trip to Haiti that: "A growing number of travelers are volunteering on their vacations, but they sometimes end up doing more harm than good." After dabbling a little bit in this 'volunteering' business, here is our take away. Build up strengths of local community. Promote 'local' volunteering enabling 'compassionate destinations'. Facilitate that instead of 'going to save people' in another exotic destination. 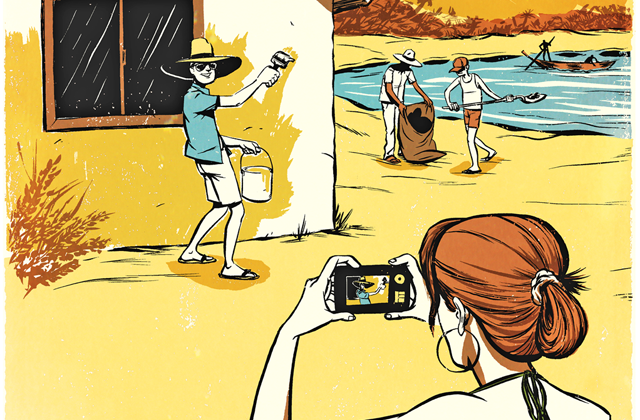 Look in your own backyard and see if your volunteering can make a difference there before flying out. None of this is a utopian idea. The world has changed a lot, and there are loads of resources available locally that can be channeled effectively. This isn't the time of missionaries running around saving children left and right. (Although unfortunately such places still do exist!) Decades of funding and volunteering hasn't brought the sustainable solutions to the suffering that they were promised. Yes, a country that was devastated might need intervention from elsewhere, I agree. However the volunteering we are talking about is either delivered few years post that or in destinations where there isn't any major 'crisis'. These clinics have catered to more than 45,000 terminally ill patients. They are run by more than 42,000 local volunteers. Micro-donations are raised locally by students and other volunteers and well wishers. And all this was built up - without international volunteers - from a one room clinic with two doctors, nurses and two volunteers 20 years ago. Here's what we do instead. During 2013, The Blue Yonder is inviting about 100 international volunteers to India. They pay 500 USD for two weeks of 'learning' with us. As a result they learn how local people with limited resources and huge constraints built the world's largest network of palliative care volunteers (chosen by the W.H.O as it's first Collaborating Centre outside the so called 'Developed World'). We are not looking at these 'volunteers' as people who can come and save us. But we are happy to have people who can work with us. And with the money they spend, we can recruit another five local doctors specialised in palliative care who can work in the peripherals of Calicut city. So what do the volunteers 'get' out of it? Ask someone like Kerrie Noonan, who volunteered here and was inspired enough to go back to her home country and set up another social enterprise called GroundsWell project. Shouldn't international volunteers be trying to do that? Learn from a destination and see how they can take that learning to build a system in their home country / state / neighbourhood? So for me the big question is: How can we all channel our energy towards cleaning our neighbourhoods first - before we set off flying 3,000 miles to 'save the world'? I urge all well-meaning travel volunteers to think about this for a second before plunging into 'saving the world' and making another tour company in the source market rich at the expense of some poor community elsewhere! Volunteering can be tremendous fun for both travellers and locals, if the attitude is more about 'learning' from locals than what Dorinda in this article is mentioning as "White Man coming to save us". (or an Urban kid coming from a city like Delhi or Bangalore to 'save' rural Indians'). Think about 'what' happens thanks to your volunteering, and after you have gone? Are you building a system that can be sustained? Or as the author mentions here what if "Construction stops whenever funds or volunteers run out"? If travellers are looking for rewarding 'experiential' travel, then do so, by chosing a company like Socialtours Nepal or Spiti Ecosphere or Ethical Travel Portal in Norway - or one of the many other like-minded companies that will help you travel through destinations where sustainable development projects are promoted, pioneered and supported. Just don't call it volunteering. It's an immersive travel experience. Isn't it? The other day I met a well-meaning Dutch man (living in France) on a yoga course in Pondicherry. On meeting one of the trustees of Aurobindo Society, he was so touched about the good work going around that he asked 'How can I come in and volunteer'. It was a well-meaning question. But the experiments of Auroville and wonderful initiatives of Aurobindo Ashram can not be scaled up if their system is 'burdened' with 'well-meaning' foreign volunteers. If the system (and the well intentional foreign volunteers) can get 'locals' to volunteer, then that's where the change will happen. If this wonderful Dutchman could 'learn' from this experience and go home and spread his knowledge, then that's fruitful too. He can even call it a spiritual quest of 'finding himself'. But if this is not the result, then volunteers will keep coming with their skills, voluntourists will keep spending their money with some tour operator, and one day soon we will forget that this was all started in the name of some poor community somewhere in the world. What if, in our selfish quest for 'answers' or for checking off a list of things to do before one dies, we might be crushing the possibility of any progress in these communities? Please, don't underestimate the intelligence and resourcefulness of local people (whether in Haiti or Uganda or my own village). Please, don't make another local person a lazy one waiting for her hand out thanks to your 'wanting' to save the world. And support our efforts if you can, otherwise for God's sake, just stay home! I am happy people like Dorinda travel to find out what the reality is. We need to give a big cheers to such people who keep on reporting back. Well said: Volutnourism poses great dangers, but it can also be a force for great good. But to succeed it has to come - like all things - from a very deep empathy.